Change is good. The growth of sports gaming over the last 20 years has been astronomical, and recent AAA releases remind us what a treasure it is to be alive. However, there are a number of features that were present throughout the 1990s and early 2000s that today’s titles are missing. I have compiled five of the most glaring absences from recent sports releases. Classic games are considered as such because of their gameplay. The limitations of earlier consoles prevented lifelike graphics, realistic physics and a wealth of other features. But that did not stop Tecmo Super Bowl, Mutant League Football, Ken Griffey Jr. Presents Major League Baseball and NBA Jam from becoming critical and cultural triumphs. In part, this may be because these games now serve as blissful time capsules to our youthful ignorance. But what really made these games classics is their arcade-style gameplay. Pick up any of these games today and feel the immediate difference in control, ability and experience from current-gen sim titles. NFL Blitz was not a hit in 1998 because it had cutting-edge graphics and a narrative-driven career mode. Blitz saw immense success due to lightning fast gameplay that incorporated insane trick plays, a host of inopportune turnovers and superhuman strengths. Plainly and simply, it was fun. The gameplay was fluid and controls were easy, but there was so much more to master. Extrapolating fans’ favorite elements of football, cranking up the absurdities and dramatically altering the rules combined for a wholesomely different experience. Unfortunately, the blissful arcade gameplay that dominated the late 1980s, 1990s and early 2000s has largely vanished in favor of hyper-realistic simulations. Titles like NBA Playgrounds are rarities in a modern market that was once equal parts arcade as it was sim. MLB The Show included a Retro Mode to harken back to the Griffey days on the SNES, but it felt like a palette swap of the the slower sim gameplay that the franchise has otherwise mastered instead of a full-fledged nostalgic mode. Taking a cue from its arcade roots, the 2010 NBA Jam reboot did an excellent job of burying tons of secret teams, players and gameplay enhancers into its unlockables vault. The Beastie Boys, politicians, and even Thanksgiving turkeys all had individual stats and animations. Playing as Shawn Kemp and Gary Payton on the Supersonics again or unlocking legendary Shaq to pair with the Magic’s mascot Stuff kept the game engaging long after its release. Unfortunately, NBA Jam fell off of EA’s radar, and despite a superbly deep revival, NBA Jam slowly fell to the wayside as its rosters stopped receiving updates. Madden, MLB The Show and NBA 2K have all demonstrated a commitment to growing their legend pools for their card-collecting modes. However, fans are not universally interested in card-collecting modes, and many gloss over them altogether. Unearthing bizarre cameos (Jamie Kennedy in ESPN NFL 2K5 or Mortal Kombat’s Scorpion in NBA Jam) provided intrigue that breathed new life into titles back in the day. What about collecting MVP Points to spend on MVP Baseball 2005’s monster collection of legends, stadiums and throwback jerseys? Regrettably, this content has shifted to a premium and exists wherein real-life currency becomes a factor. Card-collecting modes do not recapture the joy of earning these characters through in-game achievements. MLB The Show 17 rewards Diamond Dynasty players for milestones and missions, but it is not the same experience as shopping at WWF No Mercy’s still-impressive Smackdown Mall. It may be a very long time before we see secret characters and gameplay enhancers return to AAA sports titles the way they used to function. This is not exactly a feature, but its impact on classic sports games is immeasurable. Throughout the 1990s and 2000s -- the “Pre-Monopoly Era” -- there were as many as six potential games coming out for a single year of a single sport. Six! EA’s Madden exclusivity, Sony San Diego’s MLB exclusivity, and 2K’s stranglehold on the NBA do not yield much opportunity for other titles. Sure, indie titles will surface every year or so, but the lack of choice stunts the genre’s growth. Were it not for the crazy competition, would we ever have seen ESPN NFL 2K5 or MVP Baseball 2005? 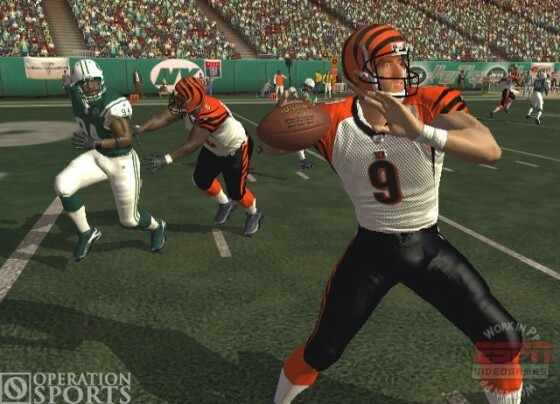 NFL 2K5 even launched at $19.99 to further encourage gamers to check it out. Could you imagine NBA 2K18 doing the same thing to keep NBA Live at bay? It would not happen because 2K has basketball gaming completely locked down. Competition meant that developers needed to get creative to retain gamers. As such, ESPN NFL 2K5 was loaded with features on top of its perfected football engine, and remains one of the greatest football games of all-time. Midway’s violent arcade sims were born out of giving players oversaturated with sims a completely new experience. When this whittles down to only one or two companies, it is easy for them to regurgitate a similar perennial product without significant feature overhauls. How much joy did you feel when a batted ball slammed into the tractor in MVP Baseball 2005’s batting practice mode? The digital equivalent of hitting the golf cart at the driving range was a pure delight as MVP trained players to take different approaches at the plate. What about the ultra-violent 2-on-2 body checking mode in NHL Hitz that taught players to master evading hits? 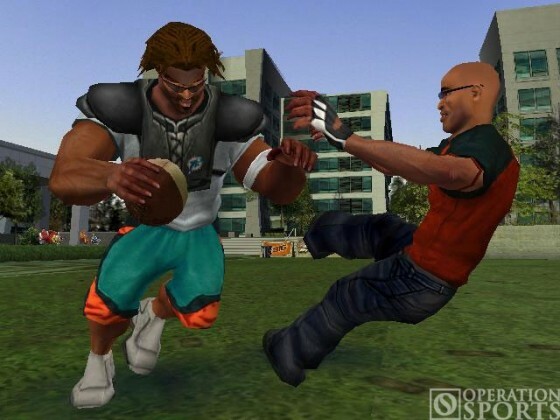 Which of your favorite celebrities and friends did you create for your NFL Challenge team in NFL Street, only to lead them to unprecedented glory? Were you able to pitch the ball six times in a single play and score? Some gamers’ fondest memories came from modes that existed completely outside of the traditional season or franchise modes. The 2K series has Blacktop, the NHL series tried NHL 94 mode, Madden has the Gauntlet, and MLB The Show has Events, Ranked Seasons and Battle Royale. But these feel more like aesthetic changes than they do a separate experience. Could The Bigs’ pickup mode be included in future Show releases? How will they revamp Retro Mode? How about an NBA Jam-style mode within NBA 2K18? Or an 8-bit mode for Madden? Gimmicky throw-ins get worn out quickly, but if EA stuck an HD version of NFL Street as a pre-order bonus for Madden 18? I know I would certainly pre-order it. One of the most enjoyable moments in sports gaming is taking your own custom teams and players across multiple seasons. Narrative-driven sports RPG modes have created new levels of immersion for players. However, creating your own team from the ground up is a bit of a lost treasure. Sure, fantasy drafts and forcing trades allow players to concoct dream rosters, but the joys of creating a team from scratch are fewer and further between these days. The NBA 2K series allows players to swap out legendary teams in franchise modes. This has been an absolute blast as players basically create their own league of the greatest teams of all-time. But what about the games that would allow you to design your own jerseys, logo, rosters and stadium? The corresponding “World Tour” modes are buried in sports gamers’ deepest nostalgic throes and allowed for unique local multiplayer experiences that we recall fondly. Additionally, create-a-stadium would have to be right behind it. These editors do not have to be crazy, even though the Tony Hawk’s Pro Skater series has been doing it well since the PlayStation 1 days. MVP Baseball and Madden allowed players to tweak stadiums from a few preset options, and the arbitrary changing of concessions prices did not yield notable functionality. However, given the strength and depth of modern consoles and software, including an advanced stadium creator could provide supplemental depth to already strong sim titles. What about you, loyal readers? Sound off on the features you miss the most in the comments section below. For me personally only Number 3 is something that I see as an issue with today's sports games. Man I do miss being able to buy a great football game for $20, now you have to pay $60 for an ok game. I will take todays more simulation style of MLBTS and NBA2k, to any of the 80's-90's sports games. Thing have improved so much compared to my very 1st gaming console with was the original atari. The 1 game I miss the 1 game I would buy if it were to come back out, is Baseball Stars, I played that game till the cartridge went blank on the Nintendo. I loved that game, and how you could rename the players and boost them up, and sign rookie, or aging vets to contracts. I did really enjoy Super Techmo bowl and played the heck out of it, but dont think it would hold my attention now very long, as without drafts and retiring players, I know I would lose interest in it. There is too much arcade still in sports games. I agree with the rest though. We need a Custom camera option back in Madden! Please stop blaming 2K for EA Sports incompetence with the NBA Live franchise. 2K beat out Live fair and square. nba 2k has added some great modes/features and teams since 2k11.....why can't madden follow suit? some historic teams and create-a-team/league features would be nice additions. mlb the show had the right idea with griffey and the retro mode. now just add some historic teams and/or world baseball classic. Seems NBA Live might benefit from selling their game for $20 option to try and compete with 2K. 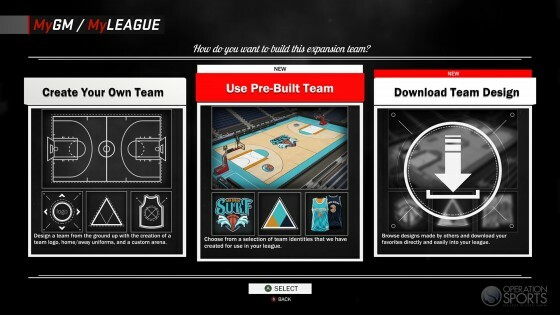 On another note, we could create some of our own nostalgia if we were given tools like schedule creation, being able to move teams to a different league or division and customizing leagues. Yep, I agree completely. I miss the days of selecting between games for that season's sport (or, splurging and buying more than one of them!). This past football and hockey seasons, I bought zero games, since neither EA product showed me enough to make the purchase worth that much money. I miss being able to throw the ball around after a play in Baseball games. I would love to see better integration of created players and teams in sports games. "The Home Team" just doesn't cut it with me. Really do miss the secret characters and unlockables. It was so damn satisfying to be rewarded for your gameplay. I generally don't even pay for DLC anymore. I already dropped 60. I don't want to pay more, and it's not fun. Apparently the NBA would not allow this. They felt that a budget title would cheapen their premium brand. This was discussed awhile back on an episode of the Press Row Podcast. Franchise modes while deep, for me have gotten too complicated. Specifically, the UI in Madden is dreadful and feels laggy. I don't want to spend an hour doing drills for players, or being forced to recruit manually and spend points. I want options that allow me to focus on playing, or at least make these add ons fun. Remember Madden 09 where you could train your player with sprint or benchpress, now that was cool. a name database. that used to be in 2k games. you could create just about any name, much more personable when the arean mc's and commentators would say the name. Awesome read. Totally agree with customisation. Why has this been so neglected from all major sporting games? It adds so many hours of longevity to their career/maanger modes. It is more than possible to do in this age though. Look at some of the lesser played/known sports games such as Don Bradman Cricket and Rugby League Live (3 now 4). The developer of these games, BigAnt has included an 'Academy' of sorts. Initially to get around lack of any licenses for Cricket. It allows community creation and sharing of players, teams, leagues, umpires and stadiums. This sharing occurs across all platforms I think. It's use in Rugby League wasn't to get around licenses as all major competitions and teams in that game are official. Despite average gameplay of Rugby League Live 3 it allowed me to create endless teams and players, access old classics and updated rosters. It added 100s of hours of extra gameplay.